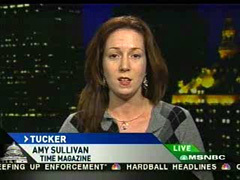 Time magazine's senior editor Amy Sullivan, who, like most of her peers in the mainstream media, is an amateur when it comes to religion, twice implied in May that the pro-life Catholics in the U.S. who are upset about President Obama's recent commencement address at Notre Dame are more Catholic than Pope Benedict XVI. In a May 16, 2009 article on Time.com, Sullivan, the former aide to Democrat Tom Daschle, and the author of an entire book on how Democrats could appeal to Christians, snarked that the Pope "may find his next trip to the U.S. dogged by airplanes overhead trailing banners with images of aborted fetuses," due to his purported silence on the matter. Less than a week later on May 21, after outlining on Time's "Swampland" blog that the semi-official Vatican news has been "calm" and "fairly positive" towards the Democratic president, "in stark contrast to the furious reaction of many conservative Catholics here," the editor quipped, "Uh, oh. It sounds like the Vatican newspaper 'doesn't understand what it means to be Catholic.'" Sullivan, like the rest of the media, was also selective in the articles she chose to emphasize from the newspaper. Sullivan claimed in her May 16 article that "the Vatican has stayed completely silent on the matter" of President Obama's commencement address. CNN's Fredericka Whitfield made the same claim during the minutes immediately before the president spoke at the university. But this is complete spin on her part, and on the part of many in the mainstream media. It ignores the plain truth that two Fridays before on May 8, Archbishop Raymond Burke, the equivalent of the chief justice for the Holy See's supreme court, attacked Notre Dame for their decision to honor the Democrat: "The proposed granting of an honorary doctorate at Notre Dame University to our President who is aggressively advancing an anti-life and anti-family agenda is a source of the gravest scandal." This is clearly not the Vatican "remaining largely above the fray while allowing - sometimes even encouraging - local bishops to be more aggressive in challenging political leaders," as Sullivan speculated in her piece, as Burke is no longer a "local bishop," but was promoted by the Pope himself to his current position. Later in the article, the Time senior editor would go on to use the "more Catholic than the Pope" label directly: "On March 24...Republican former House Speaker [Newt Gingrich] weighed in on his Twitter account, which appears to have limits on capital letters: 'It is sad to see notre dame invite president obama to give the commencement address since his policies are so anti catholic values.' There's nothing like the zeal of a convert, but Gingrich may find it's awkward to try to be more Catholic than the Pope." This is mind-reading on Sullivan's part. The Pope himself may have not spoken directly on the matter, but we do know what his mind is on the matter of Catholic institutions of higher education. During his segment with Whitfield before the commencement address, EWTN's Raymond Arroyo pointed to the Pontiff's April 2008 address in Washington, DC to the presidents of the Catholic universities and colleges in America, where he emphasized the need for such institutions to stay faithful to Church teaching: "In regard to faculty members at Catholic colleges universities, I wish to reaffirm the great value of academic freedom....Yet it is also the case that any appeal to the principle of academic freedom in order to justify positions that contradict the faith and the teaching of the Church would obstruct or even betray the university's identity and mission." First L'Osservatore Romano, the official Vatican newspaper, ran an article giving Obama's first 100 days a tentative thumbs-up. Then, as conservative Catholics in the U.S. were wringing their hands about the horror of Barack Obama's scheduled appearance at Notre Dame, the newspaper-and the Vatican in general-was conspicuously silent. Then, when the paper did report on Obama's speech, its calm, fairly positive take was in stark contrast to the furious reaction of many conservative Catholics here. But this takes the cake. In an interview with an Italian newspaper the day after Obama's speech, Giavonni Maria Vian, editor-in-chief of L'Osservatore Romano, seemed to forcefully push back against the view that Obama is a threat to Catholic values and religious freedom. "Obama has not upset the world," said Vian. "His speech at Notre Dame has been respectful toward every position. He tried to engage the debate stepping out from every ideological position and outside every 'confrontational mentality.' To this extent his speech is to be appreciated." After reaffirming that the Vatican newspaper shares the American bishops' staunch opposition to abortion, Vian went further. "What I want to stress is that yesterday, on this precise and very delicate issue, the President said that the approval of the new law on abortion is not a priority of his administration. The fact that he said that is very reassuring to me. It also underlines my own clear belief: Obama is not a pro-abortion president." Uh, oh. It sounds like the Vatican newspaper "doesn't understand what it means to be Catholic." Snarkiness aside, the editor again demonstrates her fundamental lack of understanding on the matter. Mere hours after Sullivan put up her post on the Swampland blog, Catholic journalist George Weigel wrote about the L'Osservatore Romano matter, and bashed the "pro-administration American journalists and activists [who] have leaped with barely concealed glee on several unfortunate articles" in the paper, naming Sullivan specifically not once but twice as a guilty party in his article. He also gave a good explanation as to how the Vatican bureaucracy works. ...It would, of course, be helpful if the newspaper published by the Holy See did not display a sorry ignorance of recent American history (including the history of the civil-rights movement) and a fideist credulity about the magic of Barack Obama. To assume that the pope and his most senior advisers have drunk the Obama Kool-Aid and wish the American bishops would chill out is, however, another story altogether, and not a very credible one - no matter what foolishness finds its way into the pages of L'Osservatore Romano. Sullivan also ignored how L'Osservatore Romano also recently printed a "far more critical article of Obama's stand on embryonic stem cell research, marking a clear departure from the somewhat positive evaluation the newspaper recently made of the President's first 100 days." Then again, Sullivan is on the record as claiming Obama is a "pro-life president," so what would she know about the Catholic Church?